Music is one of the most joyous and cathartic things we can do, whether it's listening or playing. Sol-Ut Press aims to help people experience music more deeply by understanding it better. In pursuit of this goal we frequently make some of our books available in their entirety for free as eBooks, both in PDF and Kindle formats. We have given away over 1.5 million PDFs since 2001. In our last event we gave away 11,162 Kindle editions of our two most popular titles, Basic Music Theory, and The Practice of Practice. Attention Bloggers and Industry Peeps! We'd love to send you a promotional copy (or copies) for you to review for and/or give away to your readers. Contact us here, tell us who you are (with links) and your address and we'll send you some books. Everybody wins! 6-Bullet Saturday: Six practice and music-related gems every Saturday. 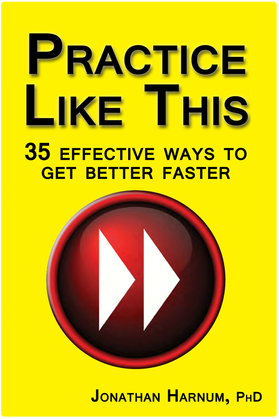 Sign up for the 6-Bullet Saturday Newsletter to get your free copy of "Practice Like This: 35 Ways to Get Better Faster." Your e-mail address will never be sold, shared, or otherwise abused.